This article covers the assembly of the injection-molded styrene plastic Dragon Models Limited (Dragon or DML) 1/72-scale M4A2(75) model kit #7305. For an in-the-box review and view of the parts please go to Modeling the Sherman Tank in 1/72nd Scale. This 1/72 scale kit represents a mid-WW2 diesel engined Sherman. Based on the square, welded driver’s hoods protruding from the 57 degree angled glacis plate this is a Sherman produced by Fisher Company. Fisher was the only Sherman manufacturer to produce and use this type of hood and it is commonly referred to as the “fabricated” hood. Other producers used cast-steel driver’s hoods until introduction of the 47-degree glacis. I have never seen applique armor plates fitted to the fabricated hoods as was common to the cast hoods. This M4A2 variant (i.e. the one with the square hoods) was used by US Marines on Tarawa Island, by the Poles in Italy, by UK forces, and by the Soviets. Many of the assessments of this particular plastic model kit should also reflect other 1/72-scale Sherman kits offered by Dragon; many of Dragon’s M4 kits share common parts. I like to start off with describing the box art so we can later compare if what is advertised is within the box. Here above we have the Company C tank M4A2 tank named COLORADO of the 1st Marine Amphibious Corps Tank Battalion, followed by a second Sherman coming up from the beach on a pleasant day in the South Pacific, though the palm trees appear well abused. For features: the M4A2 has the wide M34A1 gun mantlet, the fabricated (welded) driver’s hoods on a 57 degree glacis. We can see a tow cable attached to a front shackle and running back toward the engine deck. The vehicle horn is mounted down by the port (left) side fender rather than higher on the glacis with a brush guard. The differential cover is the one-piece rounded intermediate style. The tracks appear to be the all-steel T-54E1 type. There is no gun travel lock on the upper glacis plate. Notice that there are no sand skirts which were favored by the British. Though it looks like the tank could be painted in a two tone soft-edge camouflage pattern, this appears to me to be dust and shading, it should be all olive drab color. On the side we see the vehicle name Colorado in white and a two-color charging elephant drawing common to this tank unit. What we don’t see are big white stars typical of US Army AFVs of the European Theatre. The underside of the DML M4A2 hull appears accurate. Here we see the starboard side floor escape hatch, the air ventilation grill under the stern overhanging cowl, and the well-done idler wheel mount. The rear transition piece between the rear plate and the floor is flat plate rather than the curved plate also used by Sherman manufacturers. Dragon’s way of attaching the Sherman sprocket wheel is superior to all other methods used by other kit makers, they have a long rod on the sprocket that slides into the tube protruding from the hull side so the attachment is strong and straight. Comparing the gray plastic DML hull rear to the MR kit we see that the DML sponson side is a tad lower than that on the MR hull; I believe that DML is correct. On the rear plate are mounting holes for separately molded tools. Here is a comparison photo of five upper hulls of 1/72 scale M4A2 kits: one from ARMO, three from DML and one from MR Models. The Dragon Models subject of this kit (#7205) review is in the center, the angular welded “fabricated” driver’s hoods are evident compared to the rounded cast hoods of the two kits to its left. In addition to different driver’s hoods there are slight variations in the engine deck grill and other features that reflect different manufacturers, early and late production changes and interpretation by the model companies of what their M4A2 model should look like. At this point we’ve jumped ahead in assembly and are ready for painting. 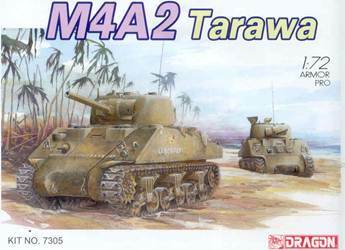 This left rear view shows the welded-on rear fuel can rack seen on Marine Shermans on Tarawa Island filled with American fuel cans taken from an Academy model kit. Copper-wire grab handles have been attached to the three open hatches. Etched brass brush guards are installed over head and tail lights. Fit of the Dragon DS band tracks around the wheels was perfect; not too short or too long. DML Sherman kits are about the only kit I have where the kit’s plastic lifting ring parts are done as well or better than I could reproduce from copper wire. At this stage several small braces missing from the front fenders have been added. I found it odd that the two towing attachments were not included on the DML kit’s differential housing, the nose. So I had to replicate them in white styrene. The DML band tracks went on well, not too tight or too loose. The tracks do not sit flat to give the impression of rolling over uneven ground when I mount the model on a base. I painted the lower suspension and roadwheels prior to affixing the tracks. The etched brass headlight guards from the brass fret included with the model are attached but I left off the headlights, sometimes done in combat. Based on my reference photos and common to early M4 variants I did not add the brass periscope guards. Overhead view of the DML M4A2 for comparison. The track-tensioning wrench and hammer have been deleted from the rear plate for the fuel can rack but I do not know where the Marine crews moved them to. No 50-calibre AA machine gun is mounted on the cupola ring as seen in my reference photos. The fuel can’s handles are not accurately detailed so I plan to cover the cans with a wrinkled tarp. After the initial base coat of acrylic olive drab paint a point wash was applied in crevasses and around high spots on the model. The wash I prefer is made from black or brown artist oil paint diluted in turpentine. This oil-based wash would only be applied over a water based acrylic paint; it will dissolve and lift an oil-based paint. Many modelers prefer a cleaner solvent but I personally like the smell of turpentine. White metal US Army WW2 tanker figures, produced by AB Figures, are test fitted in the open hatches. These figures tend to be squat with short dwarf-like legs but they are fine for mounting in AFV hatches. The base is a piece of Plexiglas sign material broken into an irregular shape and covered with fine sand and painted with Model Master Randone Tan color acrylic paint to represent sandy soil on Tarawa Island. The final coat of olive drab has been applied blending in the oil wash, then a water based point wash applied. The undersides of the hatches have been painted OD as well, which is typical for AFVs. Though hard to see, a clear acrylic gloss coat has been applied over the flat paint in preparation for the US Marine markings from the Dragon kit decal sheet. This Marine M4A2 vignette represents Company C, 1st Marine Amphibious Corps Tank Battalion serving in the Battle for Tarawa Island, November, 1943. Tarawa is a small island in the central Pacific and a former British colony in the Gilbert Island chain. Being a coral island it has light sands, as opposed to black volcanic sand like Iwo Jima. The model is finished and mounted on some groundwork on the broken sheet of blue Plexiglas and a couple of Marine infantry figures. The rear fuel can rack is visible. The DML water slide decal markings applied well and the clear decal film disappeared under a spray of clear flatcoat. I very much like the detail that DML put into their 1/72 Sherman kits, such as the strip along the bottom of the hull to mount side skirts. The Dragon band tracks I feel look very good; certainly better than the MR resin Sherman tracks I used recently. The vehicle has been highlighted using Tamiya Weathering Master which looks just like woman’s cake makeup and is applied with a foam brush. This photo shows off the well-done fabricated hoods and open driver hatches, the M34A1 gun mantlet (rotor shield), as well as the nice detail of the figures. The tow cable is replicated by a teabag string which has been soaked in white glue and attached to plastic cable loops included in the Dragon Sherman kits. I like pieces of darkened camera film cut into small pieces to represent the periscope lenses. Overall I found this a great small scale model and pleasure to build. Dragon’s M4 Sherman series of small scale models is one of their finest in detail. Dragon’s range of Shermans is near complete; I hope they would release an M4 composite (hybrid) hull version and early direct-vision hull versions as well. Some modelers prefer link & length tracks, though I am pleased with the Dragon band tracks. For me it’s not as much what the tracks are made of but how well they are rendered. M4A2 Sherman, Part 1, by Wojciech J. Gawrych, Armor Photogallery #11. An excellent soft cover reference book. Modeling the Sherman Tank in 1/72 Scale website. Doug Chaltry’s excellent website on the Sherman tank. Sherman Minutia website. This is the best on-line reference for the details of the Sherman tank variants; not as much of vehicle history though. 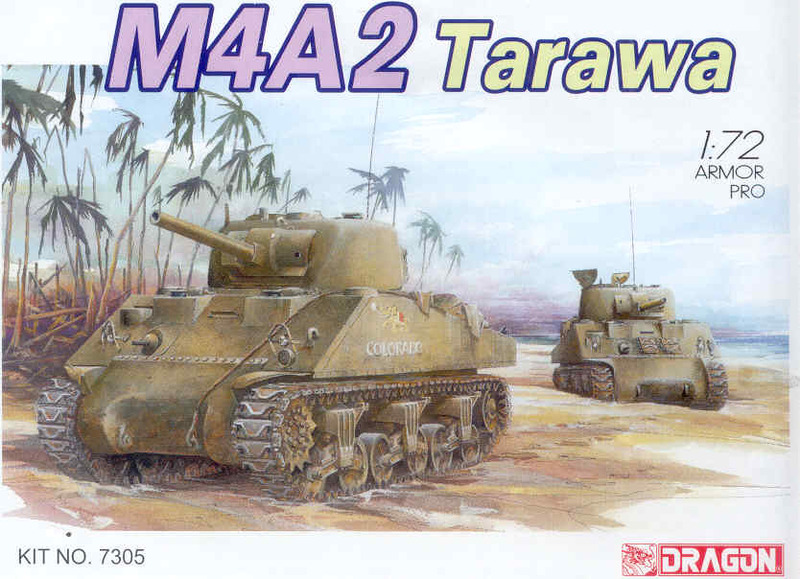 Modeling the US Army M4(75mm) Sherman Medium Tank, by Steven J Zaloga, Osprey Publishing Ltd. (2006). A great softcover on 1/35-scale Shermans from a master modeler and author, helpful for small scale Shermans even if it does cover the less challenging 1/35 modeling scale.